Welcome to South Bay Ford Commercial! As your trusted custom commercial vehicle headquarters, we have over a 100 years in combined experience in the industry. Our dealership has been awarded nine President’s Awards by Ford in both Sales and Service, and we're a Ford Motor Company Qualified Vehicle Modifier (QVM) certified. Customer satisfaction is our priority. Let our team of commercial experts build deliver the custom commercial vehicle for your business. Let our financial department develop the right payment schedule for your budget. And let us keep your vehicle in tip-top shape through our dedicated fleet service center. 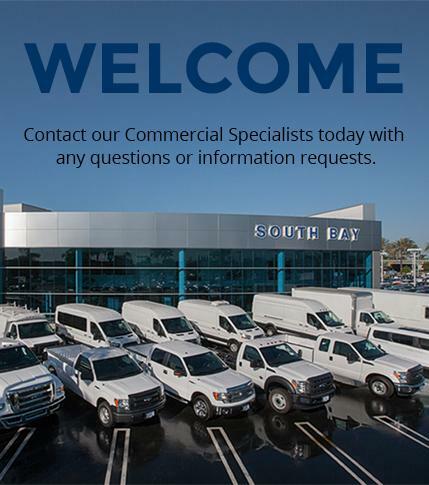 At South Bay, we want to be the first place you think of for all of your Ford commercial vehicle needs. Speak to our commercial experts about the exact specifications you want in your fleet vehicle. We'll ensure it has the right features, including custom bins, racks, shelving, and other cargo storage and hauling equipment. At South Bay, we only use the best name van equipment manufacturers like Utilimaster and Morgan Olson. Are thinking about adding some "green" in your fleet vehicles like Compressed Natural Gas (CNG) and Liquefied Petroleum Gas (LPG)? We don't blame you. Not only do they release fewer pollutants and greenhouse emissions than the standard gasoline and diesel engines, but cost less per gallon. Also, such "alternative fuels" reduce dependence on foreign sources of oil since they're processed and distributed in the United States. Let us assist you in financing your fleet vehicle as well. Our finance experts are experienced and have access to loans and leases from Ford Credit, Ally Bank, Hitachi Capital and Daimler Financial. They will work with you to choose the right financial package for your operational needs. As a family-owned dealership, we understand the greater need for financial flexibility. So we encourage you to find out about our programs like combined billing, a commercial line of credit and no early payoff or hidden fees. 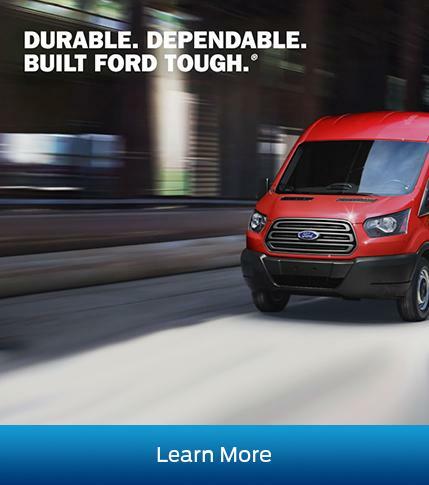 Finally, we believe preventative maintenance is pivotal in keeping your Ford commercial vehicle running smoothly. Thus we encourage you to have all your service needs be fulfilled at our service center at 13900 Hawthorne Blvd. Our technicians are master trained and Ford certified. As skilled professionals, their goal is to get your vehicle to optimum performance and back on the road as soon as possible. This is especially true with our Quick Lane, where no appointment is necessary. As you wait, please enjoy a free, made-to-order meal at our exclusive in-house bistro as well as take advantage of our complimentary Wi-Fi. We also offer a first-rate shuttle service for your convenience and an on-site Enterprise Rent-A-Car representative as well. So enjoy exceptional service today at South Bay Ford Commercial. Soon you’ll see why our customers drive off our lot with a satisfied smile on their faces.